Google “The Michael Character” and expect to find featured reviews in prominent indie music blogs, a social calendar littered with gigs, an official Reddit band of the month nomination, and yourself with a serious case of early-stage FOMO. 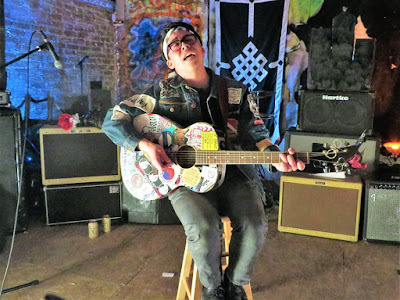 Referred to by journalists as “a prolific folk punker” and “(legitimate) activist”*, The Michael Character appears to be the greatest addition to folk punk that you never knew existed. "I look at songs as ways of initiating difficult conversations with lots of different people simultaneously and indirectly." Musician James Ikeda has produced 7 acoustic punk records under the alias of The Michael Character since 2011 and will be releasing his 8th recording and follow up to the well-received 2015 album 'Do Your Work', entitled ‘Wheelie?’ (mixed by Benjamin Greer of Sun Brewed Records). The 10-track record continues Ikeda’s style of quick vignettes and radical folk songs, premiering with “26” which talks about the emotionally conflicting phase of “feelin' old at the punk rock show” while “feeling like a kid at the staff party”, but advises that we rise above opinions and just get over it. If your sometimes insecure, kind of blunt, partially reflective, slightly opinionated, fed up 50% of the time inner monologue auditioned for a musical; it might sample a track from a TMC record. Taking a philosophical approach to advocating the recognition of racism, sexism and social standards, by highlighting inner conflict, and his general observations, The Michael Character often stimulates dialogue by pointing out the methodology for learning from failures, and driving change, but keeps his authoritative tone in check by explaining his lyrics are based on personal experiences. You can learn more about The Michael Character by visiting the official Facebook page. "26" is available now for free download (at a name your price donation) on Bandcamp.